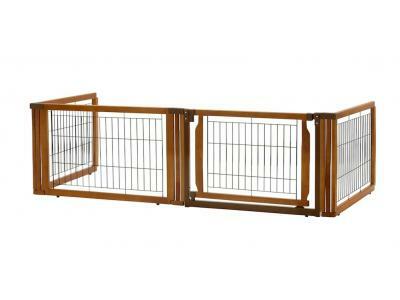 Richell's award-winning Convertible Elite Pet Gate is now available for small, medium, and large size dogs! The luxury of three pet products in one! The new Convertible Elite Pet Gate converts quickly and easily from a free standing pet gate – to a room divider – to a pet pen! 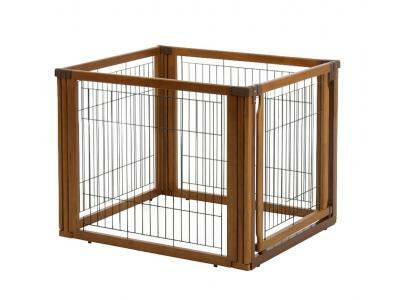 It’s specifically designed to confine your pet safely in areas with larger openings, yet fit beautifully in any home décor! The gate includes a lockable door that allows you to move freely from room to room without having to shuffle the entire unit. Each panel locks in place at 90⁰ and 180⁰ angles using a specially designed cap, which also provides extra stability. 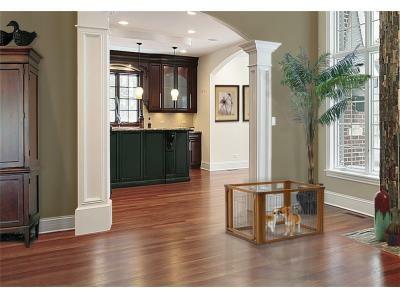 The gate's beautiful hardwood construction complements Richell's other fine wood pet products. 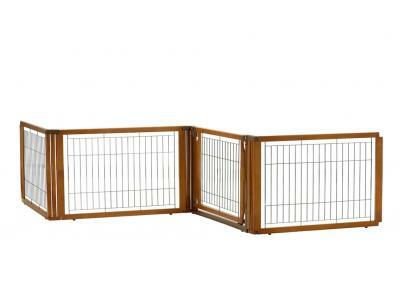 3-in-1 pet gate - can be used as a freestanding pet gate, a room divider, and a pet pen!